Name and Address are available with a simple click. Just select the button to the left titled "Want Name/Address." Nestled in the hills of the San Gabriel Valley this Fine Tea Room sits serving some of the Best Teas from around the World. Teas are imported from China, India, Japan, Taiwan and Sri Lanka. The Owner grew up growing, picking and brewing traditional teas in her home. She helped her grandfather run a tea room in their local town as well. This developed into a Love for fine teas she set out to share this experience with the local neighborhood as well as those tea lovers that come from miles around. to enjoy some of the rare teas they carry here. They also offer some very enticing sandwiches that accompany a nice cup of tea and bakery treats such as scones and muffins to take care of that sweet tooth and complement your tea choice. The comfortable furnishings make this a great place to come and relax as you learn about the art of tea brewing. 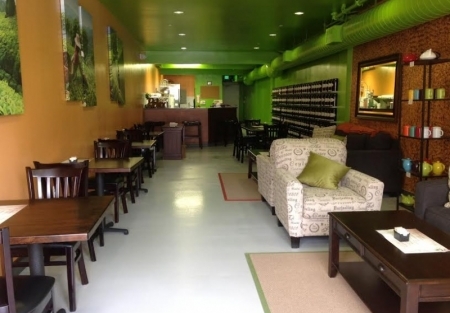 They offer tastings where a group can come in and taste many varieties of great teas. Then when you find that tea that just fills that craving you can buy teas to take home to brew and enjoy everyday. This Beautiful Village Area where this business is located is in a prime area with no vacancies in the current vicinity, so if you have a concept you want to add or fully change to, this is a very reasonable price to pay for an established business in this area. The landlord is open to an owner that might want to add a hood and cooking equipment to increase the customer base. The patio tables offer nice outdoor seating to enjoy the beauty of this quaint village atmosphere this town offers. The clientele are some of the town and area leaders from the mayor and other community leaders, they make this their spot to kick back and enjoy their favorite brew. This business is run as a family business and there are no hired employees. Seller will train buyer and assure they are able to keep the contacts to these fine teas. The hours are limited and a buyer could elect to add more hours and open Thursday that are currently closed. So to see pictures and get name and address just click the Gold Tab "Sign NDA" and you are on your way to some of the best teas in the World.